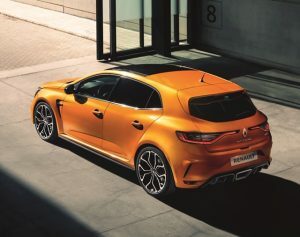 The Renault Sport pedigree is great so there’s every chance the third generation Megane RS will be a brilliant machine to drive. 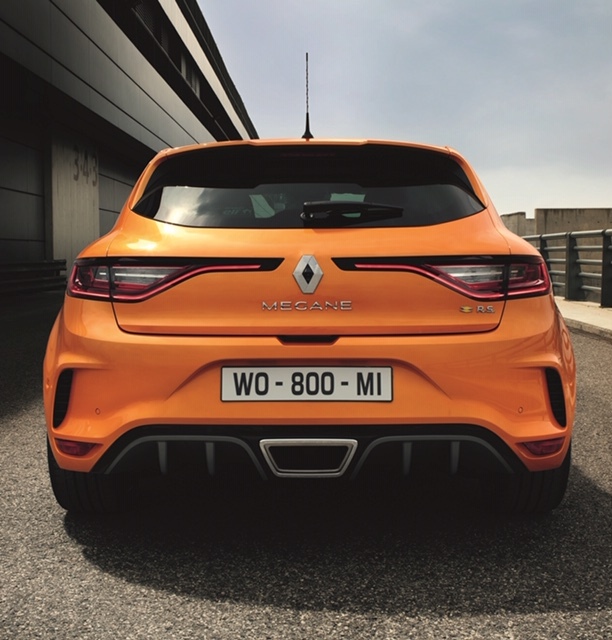 The 280hp front wheel drive machine on paper alone looks near perfect but the problem it faces is the brilliance of rivals. In recent years the stunning Honda Civic Type R, Ford Focus RS and VW Golf R have set the bar high. 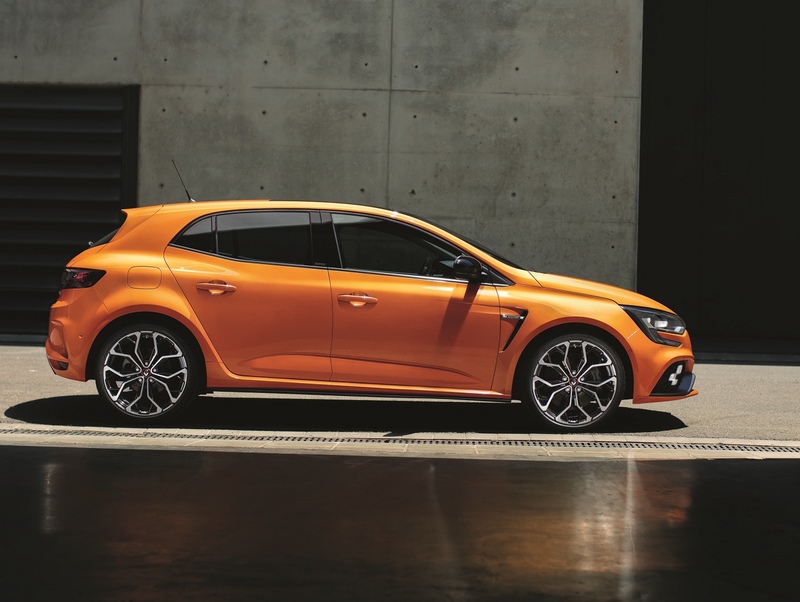 The RS looks meaty on close inspection and has a wide body that accommodates the wider track. The car’s ‘R.S. vision’ lights are cool with unique chequered flag side lights giving the car a dynamic look. The car is perhaps a little too subtle when you reflect on some of the more bonkers sport Renaults of old. In fact despite the spoilers and diffusers park the R.S. Next to a Type R with its GT kit and the R.S. looks positively tame. Inside the cabin is comfy with great sports seats and a few nods to its hot performance potential. Optional leather seats with Alcantara and red stitching (€1,500) and a few bits of carbon fibre trim helps make the cabin sporty. Our test arms had a Bose sound system (€600) and heated front seats (€250) among its optional extras. 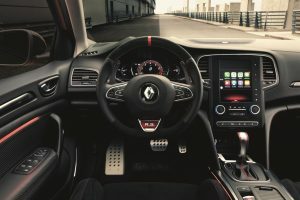 It has the same faults as the standard Megane with its infotainment screen that looks much better than it is to interact with. Laurens van den Acker’s design looks particularly impressive in the less than subtle orange of our test car. Power comes from a 1.8 litre turbocharged petrol powered four cylinder unit. 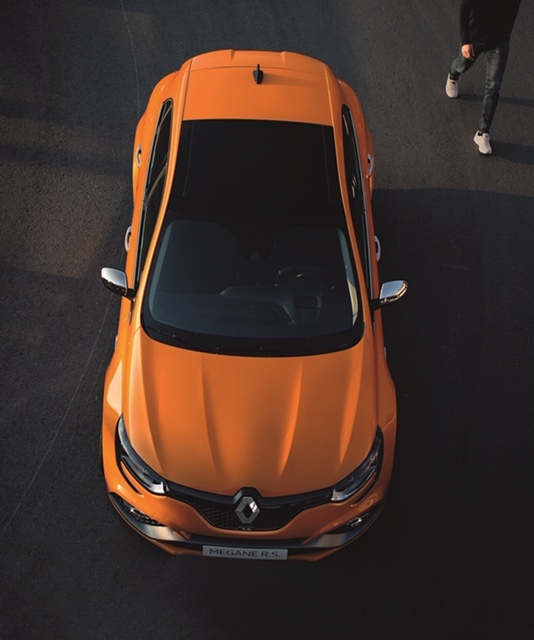 Renault says this engine is the world’s most powerful 1.8, and with 390nm of pulling power is very impressive. 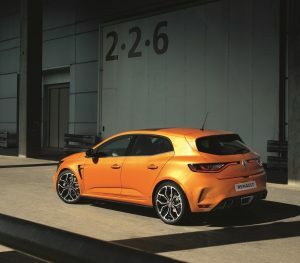 Renault’s Sport and Racing divisions aided its development. 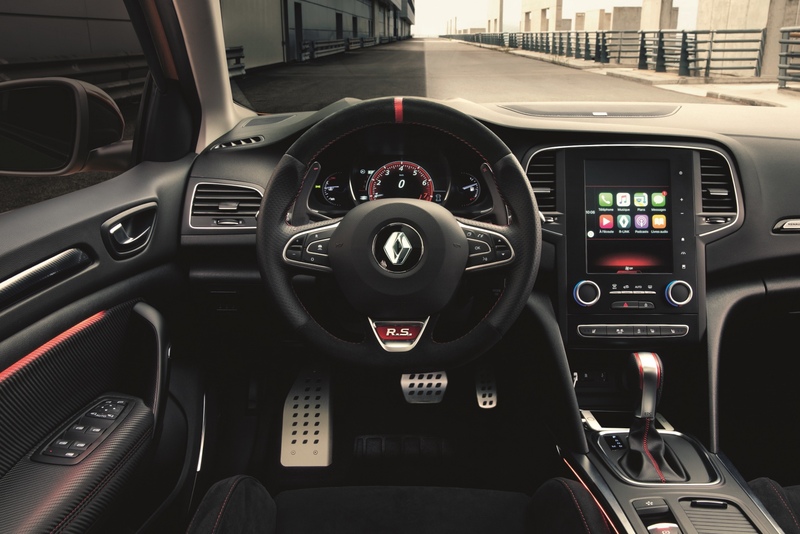 An optional auto (EDC) gearbox is available and features paddle shifters. This box works very well in the RS and in day to day driving its makes the RS almost too easy to use! Unique to the the new RS is ‘4Control’ all wheel steering. This key new ingredient makes slow speed cornering and turn-in very sharp as the rear wheels turn very slightly in the opposite direction, while when lane changing at higher speed the wheels move in the same direction as the fronts making the sensation more sure-footed. The rear wheels can turn up to 1 degree at high speed and up to 2.7 degrees at slow speed. These are relatively tiny amounts but they deliver significant affect. The Standard ‘Sport’ suspension is firm but comfortable in the RS. Hydraulic bump stops add to the improved ride quality and reduce harshness on rougher roads. For more track focussed driving the optional RS ‘Cup’ version has a more sporty suspension option fitted as standard plus a mechanical Torsen limited slip differential to aid faster cornering. Slowing the R.S. are, as you would expect, Brembo brakes (red clippers on Cup version). The Renault Megane R.S. is a hoot to drive, it’s wide track means it sits securely on the road and is quite comfortable too at speed. It slots in to a niche of its own, beating the pants off GTIs but I’d have the Hyundai i30N 275hp ahead of it. 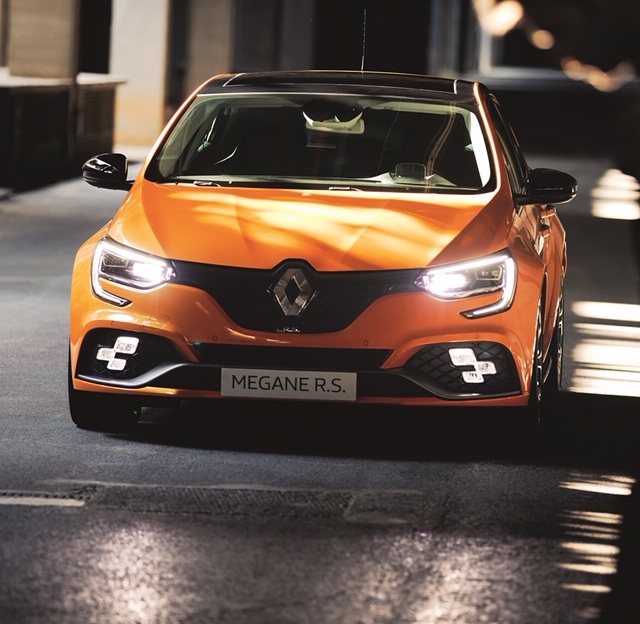 The Megane R.S. falls short of humbling the all wheel drive 300hp brigade too. €42,995 is the starting price, out test car cost €48,720.